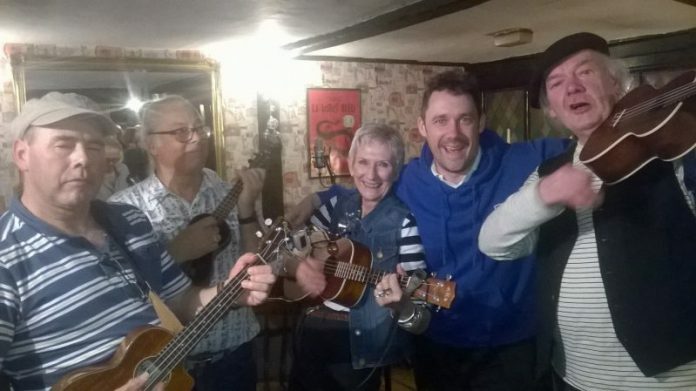 On Tuesday evening at the Queen’s Head Inn, Landgate, there is the usual night for Rye Ukulele Experiment (RUE) when newbies can join the experienced and play an eclectic choice of songs for fun. But last Tuesday, February 21, being Scallop Week, there was a special evening and the RUE band (nine members) performed at the Queens Head for the public, arranged by Scallop Week organiser Oliver Campion (pictured above), who said that 2017 was his fifth year of running the week [For more details of the Week see below]. Landlord Jonathan Breeds generously provided tasty looking scallops for listeners and players. I can’t comment, not being a seafood eater myself, but they must have been good as the plates emptied in a flash. RUE had a sea theme of varied songs with different band members doing a solo of their choice. We practice as the band nearly every Thursday, hoping to produce a good sound at the gigs we play during the year, collecting funds for a chosen charity. Our leader, Justine Benbar, keeps us interested with new songs, in check and in tune. This Tuesday there was a lovely audience, larger than previous years and they seemed to enjoy the music. Just to flag up our next big Rye gig, the RUE Festival. 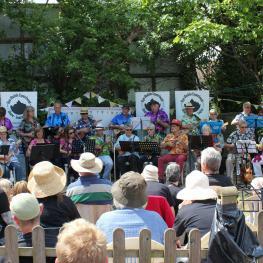 Now our third year and already we have booked many ukulele groups from various parts of England. The first year we didn’t know what to expect but the response was overwhelming with more than 200 participating in the audience. The second year that figure more than doubled and everybody raved about the fun they had, especially the ensemble singing where audience, ukulele groups, anyone with an instrument played together. The sound was awesome. 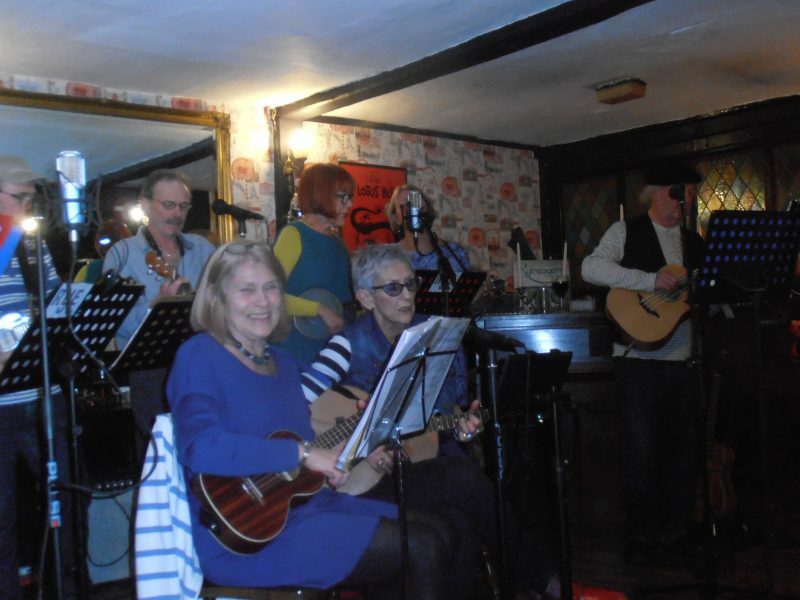 If you like music, singing or playing an instrument join us on July 8 at the Cinque Ports Arms, Cinque Ports Street, just a minute or two from the station and with a car park at the back. Our chosen charity changes but has included St Michael’s Hospice and a charity which donates ukuleles to children with a terminal illness in hospitals and teaches them to play. In 2016 we collected £1118 for our charities. For more information about RUE go to the band’s website. Charles Harkness writes: Scallop Week ends with a variety of events and no doubt lots of scallops including, also at the Queen’s Head, scallops and shanties with the Rye Bay Crew on Friday and Saturday, February 24 and 25, from 7pm. Booking necessary. Dom Pipkin is also jazzing up the Grapevine in Conduit Hill from 8pm on Friday and Mick Bolton features there on Saturday from 8pm. Also on Saturday there’s Talk and Taste at Market Fisheries by the Fish Quay from 10am-2pm and Tatners will be serving up scallops at Old Worlde Wines in Cinque Ports Street from mid-day. 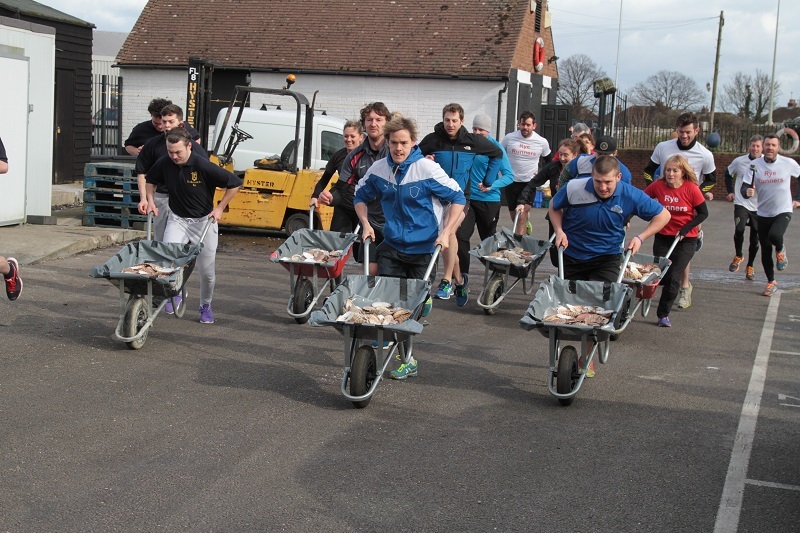 On Sunday, the day kicks off with the Scallops Race from Rye Bay Fish by the bridge over the Rother around to the Ship Inn at The Strand from 10 am. Beware flying wheelbarrows piled high with scallop shells ! In the afternoon there’s a touch of the classics at Rye Creative Centre in New Road with Rye-citals at 3:30pm, and more up to date music from Roger Carey and Andy Williams in the Wipers at 4pm (behind the Ypres Tower museum) and Steve Zackim at the Grapevine from 8pm. And back at the Queen’s Head there is a Big Scallop Quiz at 7:30pm.